Matthew Yanchuk's ethereal stoneware set was inspired by architecture and the asymmetry of cityscapes. Matthew Yanchuk's stoneware set feels as if it was plucked from another, more enchanted, world. Defying the traditional "rules" for nesting bowls, the design plays with asymmetry and depth. To create these avant-garde ceramics, Matthew draws inspiration from architecture and the way buildings in a cityscape create a stunning, angular pattern in the sky. He finishes each piece by pressing everyday objects into the sides for texture, and adding a combination of glazes to achieve a shading effect. 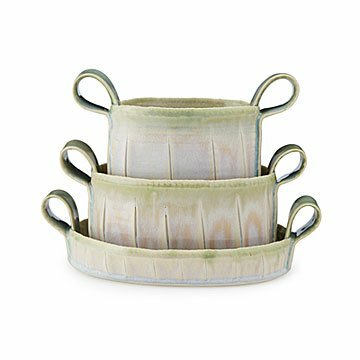 A unique wedding or housewarming gift, the set's unconventional look adds charm to hors d'oeuvres, soups, or a simple bowl of fruit. Handmade in Long Island City, New York. From his Long Island City studio, Matthew Yanchuk looks across the East River at the stunning, angular Manhattan skyline. He mimics the depth and asymmetry in his ceramics, which are stand-alone, functional pieces of art. The earthenware and stoneware designs have a wide range, and lend themselves to different crafting methods including wheel-throwing, hand-building, and slip-casting. Matthew is also fascinated by fabrics and texture, and uses various found objects to create unique surfaces in his work. It’s his goal to find the balance between artfulness and utility in everything he creates. He lives and works in Queens, New York. Hand wash only. Not microwave or oven safe.